Freedom models his new Majyk Equipe XC boot. He’s been wearing them hunting and I’m impressed by how cool his legs are when we come in. For many years I’ve taken a minimalist approach to protective boots. In other words, I haven’t been using them. Partially, it’s my discipline. Boots can be a problem when foxhunting because the horses wear them for a long time and they trap water and dirt (which makes them rub) and a lot of heat can build up in boots that aren’t breathable. Boots are not as common in hunting as they are in eventing — just a small percentage of the people I hunt with boot their horses. I’ve never subscribed to the notion that boots can offer any real support. 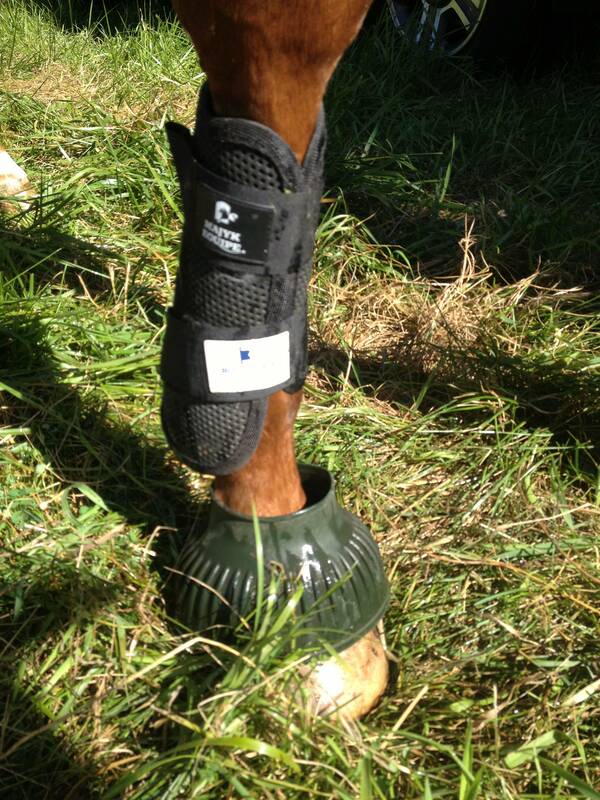 At best they restrict the movement of the fetlock; at worst boots that are too tight can cause problems. Then Freedom damaged his check ligament. The vet thought the most likely scenario was that he caught it with a hind hoof while galloping in his pasture. That got me thinking. Out in the hunt field, galloping over uneven terrain there was a greater chance that he could hit himself again, knock himself on a jump or get injured going through brush. I want to protect his legs as the greatest risk to sport horses is reported to be to the lower forelegs. I wanted a boot that was breathable, lightweight and would protect against concussion. So I went back to looking at boots. The first boots I bought were ThinLine boots. I like the ThinLine pads a lot but the boots made Freedom’s legs quite hot. So I went back to the drawing board. I’d read about a new boot by Majyk Equipe — the Boyd Martin XC boots — so I bought a pair. They are breathable and lightweight and they feature a padded interior lining that conforms well to a horse’s legs, reducing the chance of rubbing. I’ve used them out hunting several times now and they stay in place, they don’t absorb water and his legs are pretty cool (for one hunt I used the Thinline boots behind and the Majyk Equipe boots in front. The difference in the heat retention was significant). The Majyk Equipe boots were impact tested (measuring the amount of blunt trauma force able to pass through different models of xc boot) by Biokinetics (Canada), a third-party testing company, and showed impressive results when compared to several other popular brands — you can read the report here. And finally, the boots are reasonably priced. I paid $80 for the front boots and have ordered fetlock boots for his hind legs. I’ve noticed that now that he’s wearing shoes behind he catches himself occasionally. So far I’m using the boots only when out hunting. What about you? Do you use boots on your horse? What’s your favorite brand and why? I will occasionally use faux fleece galloping boots or polo wraps, but I’m pretty minimal too. I never used anything when I hunted.